Fairytale-like natural scenarios expect you in Tyrol, starting with waterfalls right through to deep gorges. 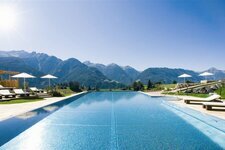 Astonishingly beautiful natural scenarios expect you in the most beautiful places of Tyrol. Embedded in an amazing scenery there are gorges and waterfalls, dripstone caves and ice caves. The variety of offers is huge, and the choice is yours! The largest waterfall of Tyrol is located in Umhausen, close to Längenfeld in North Tyrol.